AAA Fire Protection Services provides complete fire protection service to Walnut Creek and all of Contra Costa County. 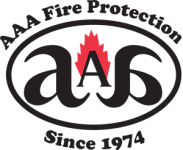 AAA Fire Protection Services has been in business since 1974 and focuses on providing quality and efficient service to each of the customers we serve. We understand how devastating a fire is. That is why our services focus on prevention and safety before, during and after a fire. We provide full Ansul fire systems for a variety of businesses, including the installation and maintenance of paint booth fire systems and emergency light installation. Our professionals provide quality, emergency light service including emergency light testing and emergency light repair so that your business is always protected. While fire prevention is always a top priority, we also focus on what happens during a fire. That is why emergency lights are so important. In a fire where there is a loss of power, emergency lighting helps to illuminate the darkness and show people the safest way out of the building. AAA Fire Protection Services is proud to work with businesses of all sizes. We are licensed and bonded fire suppression system business with a highly trained staff of professionals.